Gluten-free, rubbish-free, definitely not taste-free!!! 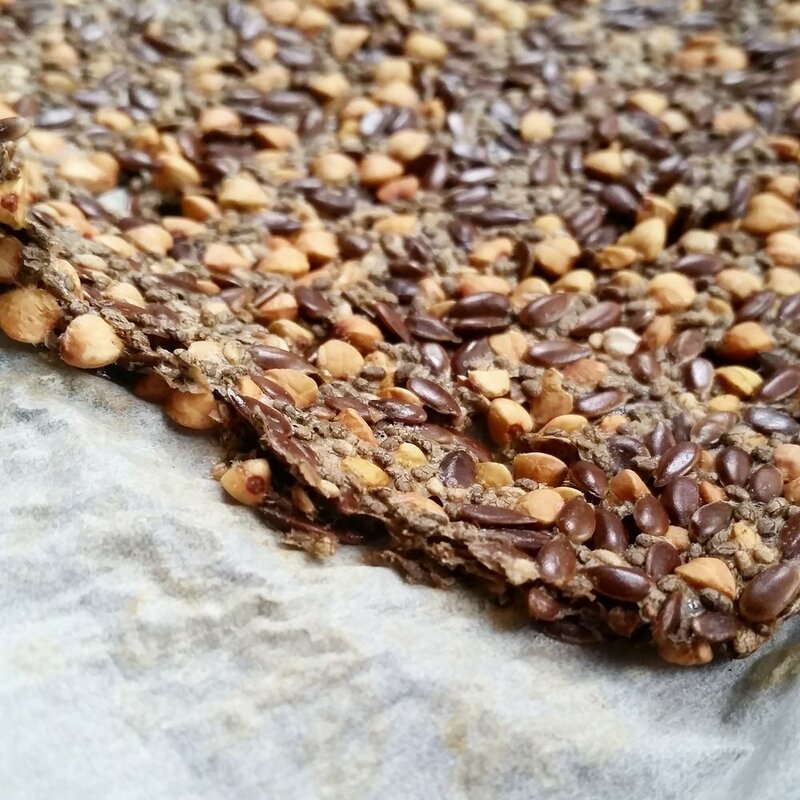 I saw these yummy looking, organic, seeded crackers in the health food section of the super market the other day, and whilst I thought they looked amazing, I wasn't sure the $8/box price tag was quite worth it....so I set out to create my own. After a couple of a goes and a bit of tweaking, I've got a recipe that I'm sure I will use many, many more times. When it comes to snacking, I'm definitely more of a savoury girl so it's nice to have a healthy cracker option to munch on. Plus, they're full of fibre and really good for your bowels! 2 tspn A. Vogel Herbamare seasoning (but you could use regular salt). Optional: You can add sunflower seeds and pepitas (I would have but didn't have any in the cupboard); also use any spices you prefer (I'm a big cumin fan)! Fill the bowl with enough water to cover the seeds, and 1 cm more on top. Give it a good stir and let it sit for 30 minutes for the liquid to absorb. After 30 minutes, stir again and let sit for another 30 minutes. After it's sat for 1 hour, you'll notice that all the mucilage (that jelly-like substance) from the chia and flaxseeds creates a nice, sticky consistency. Line a large, rectangular cookie tray with baking paper. Spread the mixture onto the baking paper - evenly and thinly (the thinner you spread it, the crunchier your crackers will be). Bake it in the oven for 1 hr 15 mins. Let cool and gently peel off the baking paper. These really are simple to make (the hard part is the waiting!!! ), and the water and mucilage from the seeds act like the 'glue' to stick them all together. Considering crackers can often have a bunch of unnecessary additives, these are a fantastically, clean and healthy option.